On Friday, November 3, 2017, the Raleigh AGO chapter sponsored Dr. Stephen Hamilton in recital at Edenton Street United Methodist Church on its five manual Létourneau pipe organ. Hamilton played an exciting recital of Reger, Langlais, Messiaen, Bach, Franck, Alain and Dupré. His performance was very well received. On Saturday, November 4th, the chapter held a ”Church Music Repertoire Workshop” at Highland United Methodist Church in Raleigh with Stephen Hamilton as clinician. The workshop included handouts listing many of the pieces Hamilton demonstrated, which were seasonal organ favorites, new music, music for organ and instruments, collections or commissions, and music for special events. The workshop was very helpful for all levels of proficiency. Raleigh's Edenton Street United Methodist Church is the home of a very large pipe organ built by the Canadian firm of Létourneau Organs. 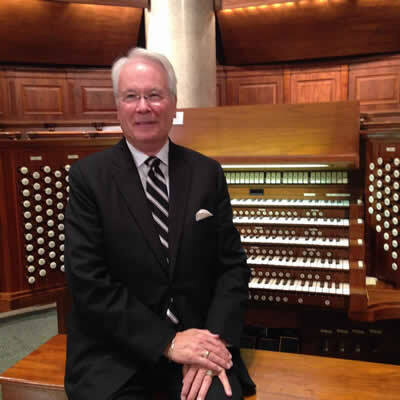 For Stephen Hamilton's recital, sponsored by the Central NC Chapter of the American Guild of Organists, the five-manual console controlling the organ's near-100 ranks of pipes was moved out of its usual position within the choir stalls to the center of the chancel. This made it possible to see more than one usually sees of an organist's technique; e.g. Hamilton, Minister of Music Emeritus of New York City's Church of the Holy Trinity (Episcopal), chose his program to highlight many of the organ's colors. The first half began and closed with music by the titans of the German Romantic and Baroque eras: Reger and J.S. Bach. Two Reger works showed this great composer's expansive/bravura style and his more introspective writing; the Introduction and Passacaglia begins and ends with the full organ, while the Benedictus calls for the quietest sounds of the instrument as its principal tonal palette. Hamilton played both works well. Next came two works by Jean Langlais, one of France's celebrated blind organist-composers. His music is steeped in the atmosphere of plainsong; the Hymne d'actions de grâces "Te Deum" and the "Chant de Paix" which followed are two of Langlais' most frequently played works, for good reason. The "Te Deum," excerpted from the composer's Trois paraphrases grégoriennes, is a heavily-accented and rhythmically-driven exuberant work; the "Song of Peace" which followed was peaceful. Hamilton's performances brought both works to life. After intermission, Hamilton gave a beautiful performance of Franck's Choral No.1 in E, its long melodic lines soaring appropriately, its intimate moments and its grandiose moments equally inspiring. This was followed by Albert Alain's "Aria," one of a set of six pieces which Hamilton learned while studying with Marie-Claire Alain, Albert's daughter. This work, rather like a musette in character, featured the organ's Cromorne, that distinctively-French Baroque reed. Two works by Jehan Alain followed: his "Le jardin suspendu" and "Litanies." Alain prefaced each of these works with explanatory quotations which were, unfortunately, not provided.. The "Suspended Garden" piece was exquisitely played. How to end a recital of mostly-French organ music? With a wonderful French toccata, of course! Hamilton chose the first (in the key of B) of Marcel Dupré's Opus 7 – Three Preludes and Fugues. A tour-de-force for a master organist, this work by the man who taught several of the other composers on this program was played brilliantly. It was an exciting evening for lovers of pipe-organ music! On November 10 at Zion Evangelical United Church of Christ downtown, Dr. Stephen Hamilton presented the first in this year’s AGO Artist Recital Series, playing superbly on the 4-manual Kimball/Casavant organ. He began with the Allegro from Symphony Six by Widor. The majestic chordal theme on nearly full organ alternated with soul-thrilling fast passages. The movement built to a grand finale, featuring a tremendous pedal solo — what a way to start this fine evening! Next came José Lidón’s Sonata de 1º tono, opening with constant runs, then contrasting the Great principal chorus with a solo trumpet on the Swell. What exciting music! The familiar Pastorale by Franck used the reed and flute on the Swell, then the principal and the oboe to carry the lyric melody. The fast-moving chordal middle section was followed by a return of the quiet opening theme. Mendelssohn’s Sonata VI begins with variations on the chorale “Our Father who art in Heaven,” in which Dr. Hamilton took advantage of the opportunity to use several contrasting registrations. Following the climactic toccata with pedal melody, there is a fugue on a new theme, and an andante which brings the sonata to a quiet and peaceful close. In the third movement of Messiaen’s L’Ascension we experience the glory of Christ through music in a very contemporary style, featuring exciting reeds with a rapid-moving pedal part. The finale with reeds showed off that organ section very well. Following the intermission, Dr. Hamilton returned with more French music, using the Te Deum from Langlais’ Trois Paraphrases Gregoriennes. Fiery full-organ passages contrasted with quieter music on the Swell and Choir. In the Benedictus by Reger we heard the gorgeous higher flutes on the Swell, a quiet diapason on the Great, the Swell strings, and a quiet ending on the principals. The Aria from Six Pièces by Albert Alain (father of Jehan and Marie-Claire) featured a lyric solo on the Great diapason accompanied by quiet stops on the Choir, Swell, and Pedal. The virtuosic Prelude and Fugue in B Major by Dupré showcased Dr. Hamilton’s impressive manual and pedal technique; it was a fine ending to a very satisfying concert. The applause of the appreciative audience led to a French encore: Litanies by Jehan Alain. Hamilton’s selection of repertoire, labeled “Alain and His Circle,” included “L'Ascension” by Messiaen, the “Te Deum” by Langlais, “Trois Mouvements pour organ and flute” by Jean Alain, and “Prelude and fugue in B Major” by Dupré. Hamilton’s playing is fluid and virtuosic, and he knows how to coax the loveliest sounds from the Hill organ (at the University of Michigan, October, 2005). He is expressive with his physical movements at the console. His performance of the sustained “Priere” in “L’Ascension” didn’t seem static, but felt alive, moving forward. Flautist Donald Fischel joined Hamilton for Alain’s “Trois Mouvements” for organ and flute, a work that deserves to be heard far more often. Particularly in the second and third movements, the organ and flute blend seamlessly with beautiful effect. After the brilliant Dupre, “Prelude and Fugue” Hamilton returned for an encore — Alain’s “Litanies” played with a frantic, exciting, if blurry, rush of virtuosity. Performing a most taxing program with ease, here was a serious, thorough, competent and well disciplined musician who played with authority and poise. An excellent performance of the Passacaglia and Fugue in C Minor (was) given by Stephen Hamilton who obviously knew the organ's sonorous capabilities and brought them powerfully to bear in a rousing account. He took serious risks with accents of duration at one point, lingering on strong beats, but succeeded in enhancing the effect of teeming cumulation that lies at the heart of this work. Dupré's epic Passion panorama, The Stations of the Cross, is given a fresh interpretation at the hands of a skilled and talented organist. Hamilton reached a high point of his recital with Bach's Prelude and Fugue in G Major, BWV 541, a piece which displayed both the church's organ and the artist's talents at their best. He performed Franck's Choral No. 2 in B Minor, Messiaen's Prière (from the "Ascension Suite") and the Dupré Prelude and Fugue in B Major. The Franck, in the form of a passacaglia, is in the composer's most thoughtful and characteristically brooding style, and Hamilton brought it off superbly. The Dupré work was dazzling. Hamilton played Bach's massive Passacaglia in C Minor, BWV 582, with an almost rhapsodic rhythm — sweetly flexible at times but solid as iron at others. This rhythmic play gave a human edge to the majestic seriousness of the work. This performance had to be one of the supreme moments of music making in this year's or any other year's Orgelfest offerings. Perfectly suited to the organ and the temperament of the organist was the first mouvement of Widor's Sixth Symphony, a highlight of the recital... The Noël was a joyous, delicate, and refreshing piece. He played it all at a breathtaking tempo most effectively. Hamilton showed himself an orchestrator with bright tempos and registrations... His articulation and clear-voiced playing is outstanding. Leo Sowerby's Toccata was one of the most taxing and demanding pieces of the afternoon, to which Hamilton rose with distinction. The great Marcel Dupré Prelude and Fugue in B Major was fittingly dynamic and showy enough to remind us one final time of Hamilton's notable abilities. Focusing on practical ideas for the church organist, Stephen Hamilton presented two workshop sessions on "Hymns and Things" that dealt with hymn introductions, interludes and free accompaniments. Recognized as a leader in the field of church music, Hamilton conducted classes that were well organized, containing information that was immediately useful and practical.